I am writing to inform you of several administrative changes for the 2015-2016 school year. Dr. Marguerite “Midge” Connolly has accepted the position of Director of Student Services for the Weston Public Schools. Dr. Connolly has been with the Newton Public Schools for the past six years. In her first three years, as many of you may know, she was the Principal of Williams Elementary School. Midge then came to Newton North as the Vice Principal and has contributed greatly to our community through this role. In addition, this year Midge has split her time with Central High School where she has served as Principal. Midge has been a strong supporter of students, families and staff during her time in Newton. All of us at North have valued her wisdom, sincerity and positive energy. I know she will do a fabulous job in Weston and will be missed. I am pleased to announce two interim administrative appointments for the 2015-2016 school year. 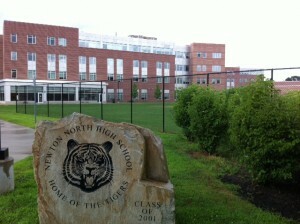 Amy Winston will serve as the Interim Vice Principal at Newton North. Amy came to NNHS in 1999 as a physics teacher and became Department Head for Science and Technology/Engineering (STE) in 2005. Since 2005, Amy has taught physics, served as department head for STE, and played a leadership role in a number of school-wide and district-wide initiatives, including the move to the new building, MCAS alternative assessments, and the implementation of the new Newton Public Schools educator evaluation instrument. Amy possesses outstanding organizational skills, an incredible work ethic, and a strong commitment to teaching and learning. To fill Amy Winston’s position, Tom Gwin will serve as Interim Science Department Head. Tom taught science at Winchester High School from 1976 to 1977, F.A. Day Middle School from 1977 to 1986, and Newton North High School from 1986 to 2003, where he also was the Science Department Head for 15 years. He retired in 2014 after serving as the Winchester High School principal for 11 years. I believe the community will appreciate Tom’s talents as an educator and will find him to be genuine and approachable. We are fortunate to have such an experienced administrator assume this role. It is truly an honor and a privilege to have the opportunity to serve as Interim Principal for the 2015-2016 school year. I am excited to continue working with the students, families and staff that comprise our community.